See how data’s connecting everyone to everything across the world, every minute. Over 2.5 quintillion bytes of data are created every single day, and it’s only going to grow from there. By 2020, it’s estimated that 1.7MB of data will be created every second for every person on earth. 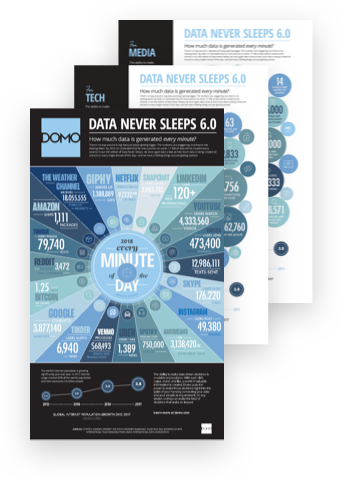 How much data is created by every swipe, click, like, purchase, search, and stream, every minute. A deeper look at some of the industries where data is driving innovation, including tech, media, retail, financial services, travel, and social media. There’s no shortage of data out there, but the ability to access and act on it whenever, wherever, and however you need is something else altogether. Domo gives everyone in your company the ability to track and act on real-time data by bringing together all your people, data, and systems, all in one place. What a minute looks like in your industry. Get the full breakdown.